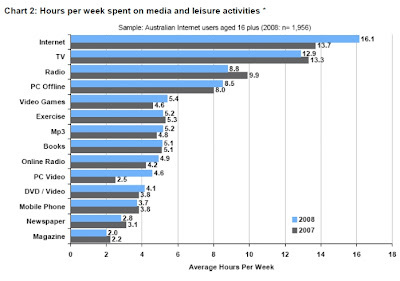 I've just come across a media release from Nielsen (PDF) from March this year indicating that internet use by Australian internet users reached 16.1 hours per week in 2008, soaring ahead of TV at 12.9 viewing hours per week (radio sits at 8.8 hours). This suggests that the average Australian internet user is spending 20% more time online than they do in front of the television - although there is also a high instance of multi-channelling - 61% of Australians watch TV and use the internet at the same time and 50% listen to the radio while surfing the net. Nielsen's media consumption chart is below. Also this morning the Sydney Morning Herald is reporting that Google is on target to crack $1 billion in revenue in Australia - a larger revenue than the entire Australian commercial radio segment, or magazines and outdoor advertising markets. With the new financial year approaching it might be a very good time to reweigh communications strategies and budgets to ensure that they are being spent on the medium where Australians are spending most of their leisure time. This signifies that we rely on internet than watching on televisions.